Hi there, Pat. I’ll do more than explain it. I’ll demonstrate it! But first, a quick tutorial for those new to this conversation. Now, where were we? Ahh, yes…Pat George has some questions. Ok. Here are some answers. A – It’s not a question of ethics; it’s a question of expectations. Like you, John Markewicz came to a public page with five million people on it. He identified himself by name, and provided a link to the profile he’s chosen for himself. Then, he started asking me questions. What reasonable expectation of privacy should he anticipate? I say, zero. I answered John’s questions in the same way I’ve been doing for the last five years – publicly and transparently. Now, I’m doing the same with you. But if you expect me to answer your questions in the body of a thread that you or someone else can later delete, then you’re simply on the wrong page. I welcome criticism, but I’m going to defend myself, and I’m not going to engage in private conversations with posters who accuse me of unethical behavior. This is not a chatroom. On this page, I stand by everything I post, and I do so in front of 5.2 million people. If you’re going to question me, you should be prepared to do the same. Q – Do you really not understand how it’s not bullying when two people of equal clout are ripping on each other, vs. a celebrity with a 5.2 Million fan page blasting out a post about a random guy with zero following? A – As a matter of fact, I don’t. I see no correlation at all between the number of people who follow this page and the way I treat the people who come here. Zero. Bullies come in all shapes and sizes, and the ones on Facebook usually hide behind fake names, fake accounts, and fake photos. I have no idea if you fall into this category, but unless you’re really Slimer from Ghostbusters, it’s clear that you want to hide your face from the world. For that reason, I agree that I would be unethical for me to find and share a photo of you that you did not share first. I’d never do that. That’s also why I’m not going to share the email I just received from John Markewicz, explaining his side of what happened earlier this week. I’d like to, but an email is not the same as a Facebook post or a profile picture. One is public, one is not. Q – Ripping a random Joe-nobody in front of millions of people is a bit of a disappointment. A – He isn’t a “Joe Nobody,” Pat. That’s the point. He’s a real person, just like you and me. His name is John Markewicz, and like everyone else on this page, he’s in complete control of what he chooses to share, and how he chooses to present himself. Moreover, I didn’t “rip” him. I reposted his question in his own words, and answered him as cordially and thoroughly as I could. As for your “disappointment,” I hear you. In fact, that’s why I’m responding to you. From time to time, I like to spar with “the disappointed,” in the precise way we’re sparring now – politely, transparently, and publicly. Doing so is not an attempt to “bully” you, it’s a way for us to talk like grown-ups and encourage others to follow suit. It’s also a way to make sure people who might know another “Pat George,” see which one I’m actually talking to. 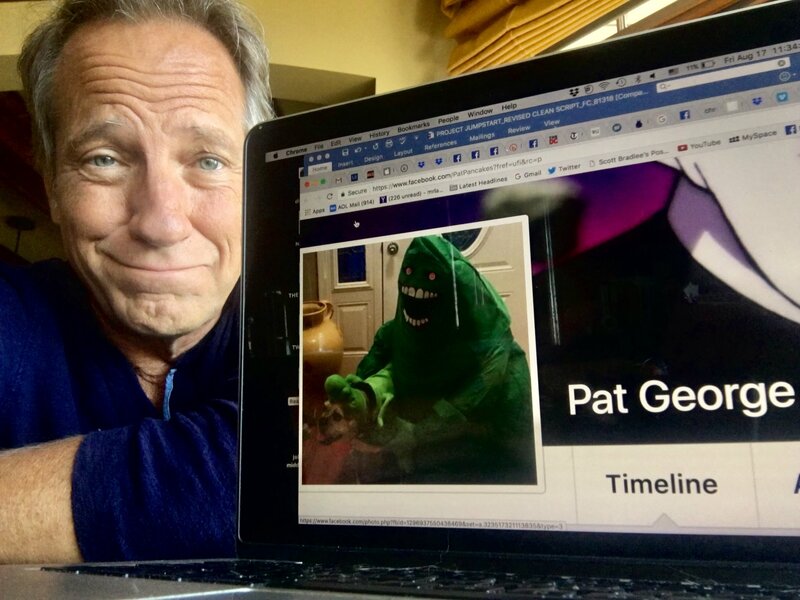 A – Believe it or not, Pat, I don’t post on Facebook to get “reactions.” I’m not here to win your approval, or embarrass you. I’m here because I value my fans a great deal, and I appreciate the opportunity to interact with them. I also enjoy a spirited and respectful debate with actual people about issues that transcend cat videos and grilling tips. But, to answer your question, I guess if I harbored any hope of achieving a specific reaction, it would be to help more people realize that accountability always enhances the odds of civil discourse. Always. Toward that end, I reject your assertion that I “called anyone out,” or attempted to “shame” the poster in any way. I simply acknowledged the identity of a man who came to a public page, identified himself, and asked me a series of questions. If he feels ashamed as a result of our exchange, why assume it’s because he was “bullied?” Why not assume it’s because he did something he regretted? Q – Mike is setting a very bad precedent for how a large platform such as his page should be utilized, in my opinion. A – Really? You think it’s a “bad precedent” for me to elevate opinions I don’t agree with? Then why did you share yours in the first place? Look, I actually think your opinion has value. That’s why I’m magnifying it. But I’m not going to separate your opinion from the person you claim to be. Why should I? Because you want me to? Because you want the freedom to say whatever you wish, while concealing your face from view? It’s your call, Pat, but I believe the onus is on you to explain why you feel the need to personally protect people from the “shame” of being identified on a public page that they choose to post on. I think it’s up to you to explain why people should not be held accountable for the words they choose. Q – Really sad that nobody in this thread is willing to acknowledge what constitutes ethical use of a large platform. This is a moral grey area that should be discussed, given these social media tools are still in their infancy. A – It’s hard to imagine a stranger sentence. I’ve read the thread you’re talking about. It reached over 600,000 people, and generated hundreds of comments about this very topic. Now, I’m magnifying the discussion that you say “no one wants to have,” and you’re telling me I’m setting a “bad precedent?” Really? Here’s what I think, Pat. You’re not “sad” because people aren’t talking about this issue; you’re sad because they’re not saying what you want to hear. And I think you’d be sadder still if the woman who started the thread that contains dozens of your comments and thousands of your words, decides to delete it. Do you really think she should have that power? You’re right – these issues need to be discussed. Why should anyone on Facebook have the power to delete any comment on any page other than their own? When exactly did the right to speak freely become the right to speak without consequence? And finally, and perhaps most importantly, how seriously should we consider the accusations of a man who accuses a public figure of being a bully, while hiding behind a child’s costume?